..Lord Commey says independent candidates are rebels, they may be expelled soon Accra, Nov. 11, Chronicle -- The National Organizer of the ruling New Patriotic Party (NPP), Mr. Lord Commey, has disclosed that the party would soon fire its members, including Members of Parliament (MP) who are contesting upcoming Parliamentary elections as independent candidates. “Any member of this great party who has decided to contest next month's parliamentary election as independent candidate is a rebel, he or she is not part of us and very soon, they would be expelled to form their independent party,” Mr. Commey stressed. He disclosed this in Accra when the NPP parliamentary candidate for the Amasaman-Trobu constituency, Mr. Samuel Ayitey Attoh, launched his campaign at the weekend to wrest the seat from the incumbent Member of Parliament, Mr. Attuquaye Amarh. He continued that going to parliament was not about life and death and so missing the opportunity to go to Parliament this year did not mean that one would not get the opportunity after four years. 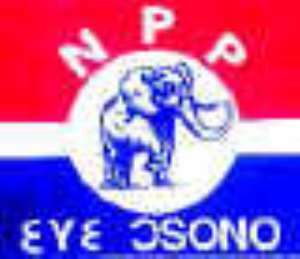 The Chronicle has gathered that by the next two or three weeks, the NPP headquarters may expel about 30 of its members who were contesting the parliamentary elections as independent candidates. Significant among these so-called rebels who are on the slaughter table are Mr. William Osei Akoto, Birim North, Mr. Osei Kufuor- Asunafo North and Mr. Seth Wiafi Dankwa, Akwapim South. Our investigation revealed also that before the filing of nomination papers at the electoral commission, an adhoc-committee was set up by the party's headquarters to persuade members of the party who had been aggrieved by the outcome of their constituency primaries and were threatening to go independent to rescind their decision. At the end of the committee's work, it emerged that liberal members of the party such as Nana Obiri Boahen, who could have defeated NPP “old boy” Mr. J.H.Mensah easily, stepped down to enable him impact his rich experience to the house for the last term. Other liberals who rescinded their decision to contest as independent candidates were Messrs. Isaac Amoo, Adjei Boye, Edward Akita and a host of others. Based on this, the party has now decided that those who failed to step down would face the ultimate consequences for disobeying the rules and regulations of the party. Notable among these extremists whom Mr. Commey referred to, as rebels were Mr. Dickson Yaw Amankwa aka “NPP stubborn cat” of the Okaikoi North constituency in the Greater Accra region. Others were Messrs. Kwasi Kumi-Offinso South, Charles Biney- Ablekuma South, Ano-Aidoo- Asokwa, Seth Adjei Baah aka Shaaba- Nkawkaw, Dr. Samuel Charles Kwasi, Ho-East, Mr. Clange Arthur -Prestea-Huni Valley, Mr. Albert Kofi Appiah- Biakoye and the Takoradi old man, Abatanpa.